Opened its doors in 2010 and has since consolidated itself as a reference for innovation and revolution in the Brazilian food scene. In its eight years of existence, the restaurant has received Best Restaurant awards from several important publications. In 2015 Oro received one Michelin Star. The restaurant has most recently won in three different categories at the Veja Rio Comer & Beber 2016 Awards: Chef of The Year, Best Contemporary Restaurant, Best Sommelier. 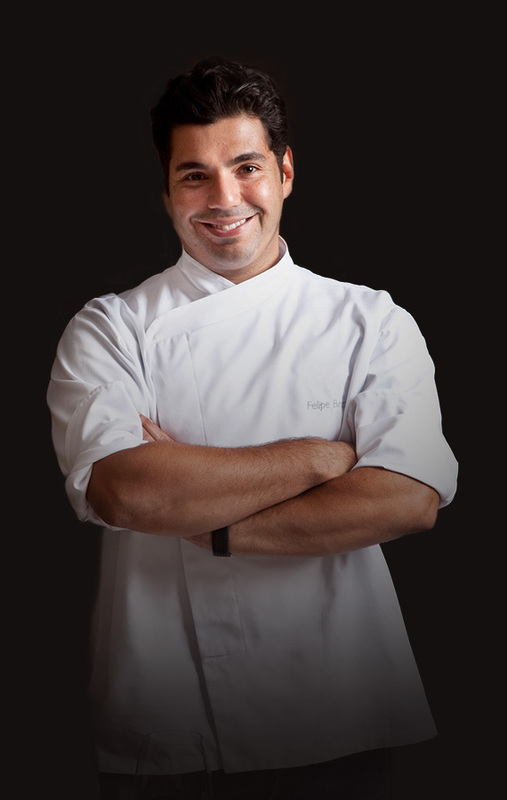 Felipe Bronze is one of the most celebrated Brazilian chefs of his generation. Throughout his eighteen year long career he has won several awards. He was named “Chef of the Year” by Revista Veja in 2010, 2011, 2012, 2016, by Jornal O Globo in 2003 and 2011, and by Guia 4 Rodas in 2013. Cecilia Aldaz was born in Mendoza, Argentina. She is a sommelier and has a degree in Oenology from the University of Mendoza. She was awarded with the title of Best Sommelier issued by Revista Veja for two consecutive years (2013 and 2014). A restless researcher of the universe of wines, Cecilia is currently enrolled in the Master of Wine program, regarded in the industry as one of the highest standards of professional knowledge. Rodrigo Guimarães has been at ORO since its inception. In 2012, he became the restaurant’s Chef de Cuisine. Rodrigo has a masters in Vanguard Cuisine from the Basque Culinary Center in San Sebastián, Spain. Fire and ambers are at center stage at ORO. We offer two menus. Our Creativity Menu is elaborated daily with seasonal market ingredients. It is a longer “walk” through our kitchen. Our Affectivity menu is shorter and consists of house specialties. It is custom made for patrons who only want a single course.